We have heard from you that overtime is becoming a large issue for various reasons. Please take a moment and fill out the following survey. This is an initial step in gathering information from you, in an effort to help address this issue! Questions? Contact WSNA Nurse Rep. Jaclyn Perkins, BSN, RN at jperkins@wsna.org. Go to the Contracts & Documents tab to view or download. Please contact WSNA Nurse Rep Jaclyn Perkins with questions at jperkins@wsna.org or at 1-800-231-8482, ext. 3118. WSNA Nurse Rep Jaclyn Perkins, BSN, RN will be WSNA/Providence VNA Home Health's representative beginning Nov. 1. Jaclyn comes with experience and years of practice. I know you will all welcome her and together, you will continue to make positive changes for Providence VNA nurses! Please thank your negotiating team for volunteering their time and doing such a great job. Some major wins in the new contract are wage, premium and education increases! Your new contract will be posted in the Contracts & Documents tab in the near future. If you have any questions, please don’t hesitate to contact WSNA Nurse Representative Debi Bessmer, RN at 1 (800) 231-8482, ext. 3112 or at dbessmer@wsna.org. We are happy to announce that we have reached a tentative agreement on a contract! Your bargaining team recommends this contract for ratification. First paycheck following ratification – 2%; 6/1/2019 – 2%; 6/1/2020 – 2%. PVNA had argued that wage increases should be reduced in light of the wage steps in our contract. The bargaining team rejected this argument and achieved wage increases that are on par with increases won by nurses in other facilities around the state. (New) Preceptor premium – $1/hour for time assigned to work as a preceptor of newly hired nurses. Charge Nurse premium – Increase from $1.25/hour to $1.50/hour. Work on day off – Increase the incentive for part time nurses from $25 to $35. 0.9 FTE nurses and up will continue to receive time and a half. Increase from $225 per year to $250 per year. The new contract eliminates the weekend back-up language. The bargaining team proposed an increase to on call pay. 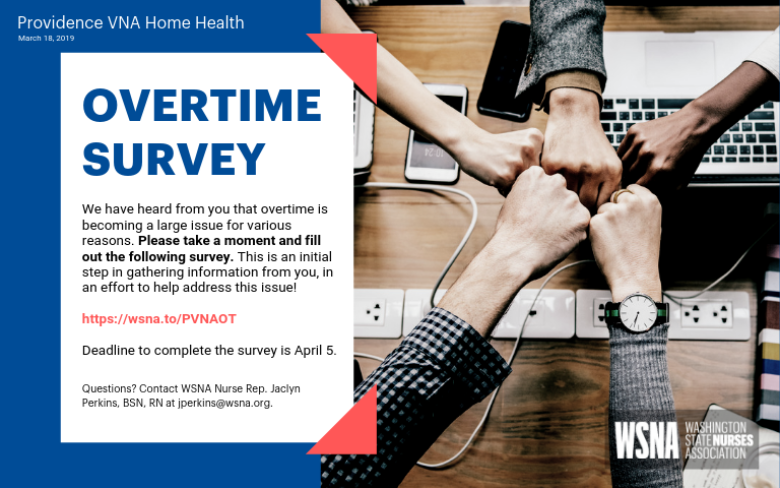 While we were unable to achieve the increase, PVNA has informed us that they are exploring options to contract out this work so PVNA nurses will no longer have to be on call. Added gender to the list of protected classifications. PVNA proposed language that would have negatively affected our access to leaves of absence due to illness or injury. The bargaining team resisted these proposals and PVNA withdrew its proposals. There will be no changes to the leave language in the new contract. For any questions, contact WSNA Nurse Representative Debi Bessmer at dbessmer@wsna.org. We had our 5th day of negotiations on July 26, 2018 and after many hours and hard work from your negotiating team, we are eager to tell you that we have a tentative agreement. Please thank your WSNA negotiation team for all their hard work, hours and dedication. We are now in the process of reviewing language and getting the contract finalized. We will get a summary of the changes out to all of you as soon as we can. Thank you for all your support and unity during these negotiations. Come vote on your contract! Your WSNA negotiation team and attorney will be present to review the changes and answer any questions. Must be a member in good standing to vote. Your negotiation team had its fourth day of bargaining with management on July 9. We received management's full proposal and have two more negotiation dates set for July 26 and 30. Join us at our next local unit meeting to hear details about negotiations. Our fight for better wages and leaves of absences continues! RSVP to WSNA Nurse Rep Debi Bessmer, BSN, RN at 1-800-231-8482, ext. 3112 or dbessmer@wsna.org. We have had another day of negotiations on June 4, 2018. We have continued to work on non-economic issues and have come to a few more agreements. We are still waiting for management’s economic proposals and really hope to have them at our next session. Our next negotiation session is scheduled for July 9, 2018. Your negotiation team had its first day of bargaining with management on April 30. We have given our full initial proposal and are anticipating managements responses and proposals at the next dates. We have two more negotiation dates set for May 29 and June 4. Your team is ready to work hard on improving our contract. Please keep an eye out and be prepared to attend future meetings and actions. Your negotiation team members are; Donni Heidenson, Brenda Willoughby and Carolyn Chandler.